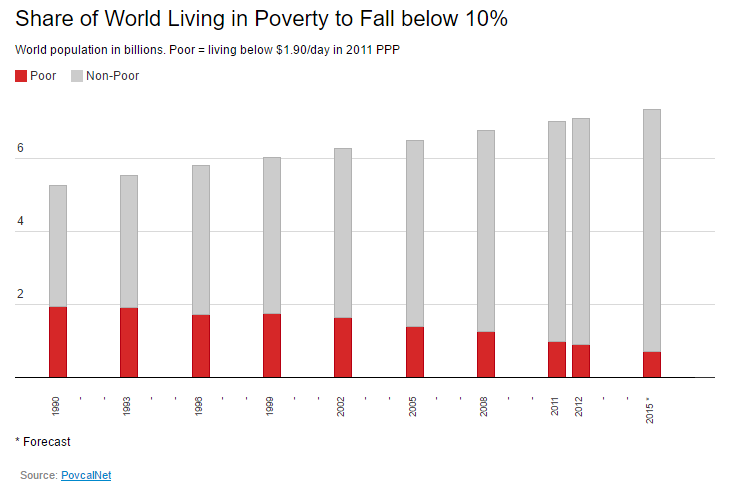 Scooper - Technology News: The world is aiming to halve extreme poverty by 2030 – but what does that actually mean? The world is aiming to halve extreme poverty by 2030 – but what does that actually mean? Sustainable Development Goal 1 is to “end poverty in all its forms everywhere” and has two specific poverty reduction targets. One target (SDG 1.1) talks of eradicating extreme poverty by 2030, building on a globally comparable notion of extreme poverty. Extreme poverty fell from 37 percent to 13 percent between 1990 and 2012 ; and based on national growth rates over the past 10 years, the global extreme poverty rate is estimated to be below 10 percent in 2015, a drop of more than two-thirds since 1990. - A large number of people have moved out of poverty since 1990, and impressively, even though the world’s population grew by 2 billion, there are over a billion fewer poor people. -There are many countries with relatively low poverty rates that still have large numbers of the globally extreme poor living there (e.g. China, India). -At the same time, there are a large number of countries with stubbornly high poverty rates where relatively small numbers of the world’s extremely poor live (e.g Haiti, Uganda). -Since the SDGs focus on “no one left behind”, when looking at poverty across the world, both rates and numbers matter. -SDG target 1.2 aims to halve national poverty rates in all its dimensions between 2015 and 2030 – as it’s based on country-specific understanding of poverty (which often differ) it’s relevant for all countries, rich and poor alike. How is ‘Extreme Poverty’ measured in SDG Target 1.1? Until 2015, progress against the MDG target of halving extreme poverty was measured by the share of people living under the international poverty line of $1.25 a day (using 2005 prices). SDG target 1.1 has also been defined as “By 2030, eradicate extreme poverty for all people everywhere, currently measured as people living on less than $1.25 a day.” The international poverty line, however, was updated in 2015 to $1.90 a day in 2011 prices, as new purchasing power parity data became available. The SDG indicator will also be updated accordingly. In October 2015, the Inter-Agency and Expert Group on SDG Indicators (IAEG-SDGs) decided that extreme poverty will be measured by whatever the prevailing “international poverty line” is, and the UN Statistical Commission has since ratified this decision. The update of the international poverty line is not new. During the MDG era the international poverty line was updated whenever new purchasing power parity data became available – from $1 a day to $1.08 a day to $1.25 a day, each time the updated line being used for MDG monitoring. Extreme poverty rates have fallen so much that the number of people living in extreme poverty has also more than halved despite population growth. Between 1990 and 2015 the world’s population increased by about two-fifths, from 5.3 billion to 7.3 billion. 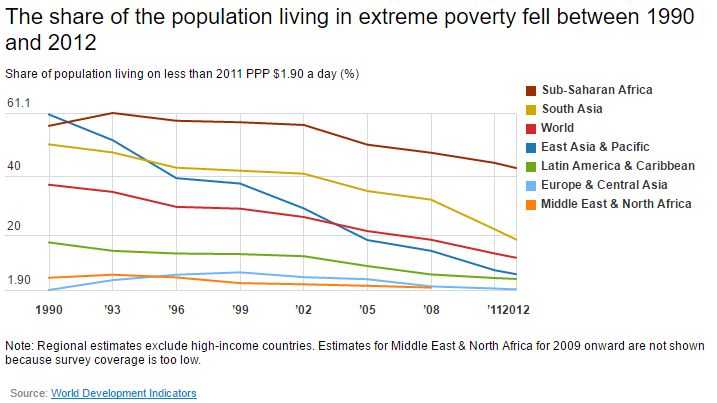 The number of extreme poor, however, was estimated to have fallen from 1.9 billion to about 700 million. At the same time, the number of people living above the extreme poverty line doubled – from 3.3 billion to 6.6 billion. Some countries have relatively low rates of poverty, but are still home to large numbers people considered extremely poor. For example, in 2012, around 230 million people in India and 87 million people in China lived below the international poverty line although these represent only around 2 out of 10 Indians and less than 1 in 10 Chinese. By comparison, in 2012, the poverty rate in Madagascar was around 80 percent, or an estimated 18 million people living in extreme poverty - far lower numbers than in India or China. This suggests that to eradicate the extreme poverty, it is important to pay attention to both poverty rates and poor populations. What will extreme poverty in the SDG era look like? The SDG target of eliminating extreme poverty in all its forms everywhere by 2030 is very ambitious. If growth rates for the past 10 years prevail for the next 15 years, the global extreme poverty rate will fall to 4 percent by 2030. If growth rates for the past 20 years prevail, it will be around 6 percent. 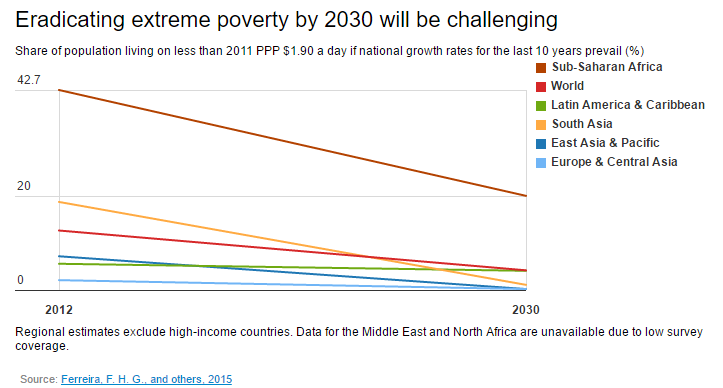 Eliminating extreme poverty will require a step change from historical growth rates. For individual countries the challenge is much more severe. Like the MDGs, the SDGs recognize that poverty is defined differently by national authorities. However, while the MDGs did not explicitly have a target based on national poverty lines the SDGs do and SDG 1’s target 1.2 aims to halve poverty rates based on these national definitions. This will bring a new perspective to poverty monitoring. At this point, most countries monitor poverty using a monetary poverty index while some countries monitor poverty using a multidimensional poverty index. Countries using a multidimensional index, such as Colombia and Mexico, assess the extent to which households are deprived in monetary and nonmonetary dimensions of well-being (such as health, education, housing, and labor market opportunities). Furthermore, it’s worth noting that that SDG 1.2 recognizes that poverty is not just an issue for poorer countries. SDG 1.2 accommodates concepts of poverty in richer countries like the United States and European Union member countries. We will be writing on the subject of halving national poverty rates in a forthcoming blog.